ATTENTION: SMALL BITES HAS MOVED! The new Small Bites is here! CLICK HERE to be redirected to Small Bites 2.0 -- with a new look, its very own logo, and part of my new website, andybellatti.com. Starting today, all future postings will be on the new Small Bites. Every single post since Small Bites' inception in April of 2007 can also be found there, so go ahead and update your bookmarks and links. This version of the blog will only stay up for redirecting purposes. I look forward to seeing you on the new site! PS: If you e-mailed me in the past week, you now know why you haven't heard from me yet! Going through my backlog of e-mails is at the top of my "to do" list now. "Shop The Perimeter of the Supermarket"? I Don't Think So! 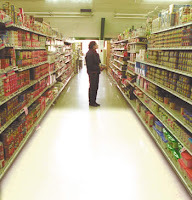 Earlier today at my dentist's office, I flipped through a fitness and nutrition magazine and spotted the ever-prevalent food shopping tip -- "stick to the perimeter of the store; that's where the healthiest items are." Alright, time out. I disagree. While the perimeters of most supermarkets offer fresh and frozen produce as well as lean protein (ranging from chicken breasts to tofu to shrimp), there are plenty of healthy options waiting smack in the middle of all those aisles! So go ahead, check out what's on sale in aisle four. Just be sure to glance over the nutrition facts -- and take a peek at the ingredient list! Quick & Healthy Recipes: Easy Peezy (Healthy!) Sweet "Cream"
Now that high temperatures are finally back in the Northern hemisphere, the cold breakfasts that seemed so miserable a few months back are suddenly the perfect way to start the day. I don't know about you, but I LOVE a bowl of fresh fruit and whipped cream. It makes for a great dessert, but it's certainly not the healthiest way to start your day. Alas, here is my couldn't-be-any-easier recipe for a healthier cream that adds body, creaminess, and flavor to whatever you pair it with! Combine all ingredients in food processor and mix until a smooth consistency is reached. For best flavor and texture, refrigerate for at least 4 hours before consuming. This tastes absolutely wonderful mixed with a cold bowl of fresh fruit! This past Friday, Cornell University John Dyson Professor of Consumer Behavior and director of the Cornell Food and Brand Laboratory Dr. Brian Wansink stopped by New York University after being tapped as the second featured speaker of a new lecture series on nutrition and chronic disease. Taking off from his bestseller Mindless Eating, his talk was appropriately titled, "How To Turn Mindless Eating Into Healthy Eating." With those prevously mentioned credentials, you might picture a stiff, "all business" type who solves complex equations in his head while half-listening to you. Dr. Wansink, however, is reminiscent of the cool high school math teacher who wanted you to learn -- and have fun while doing so. His research explanations are peppered with personal anecdotes, comedy, and facial expressions that sometimes rival those of Jim Carrey. A few hours before his afternoon presentation, I sat down with Dr. Wansink for a one-on-one interview. If you are unfamiliar with Dr. Wansink's work, please click here to familiarize yourself with his research before reading the interview. I get such a kick out of all your publicity shots for Mindless Eating [NOTE: see accompanying picture]. They're great! Have they all been photographers' ideas? Ha! Thanks. Yeah, I've had some really creative photographers who set up these elaborate shoots. Some of those popcorn shots literally took twelve hours, from setup to cleanup. There was a LOT of popcorn all over the floor at the end that had to be cleaned up (laughs). So, I recently read that all of this research started as a result of you wanting people in the United States to eat more vegetables. How did you go from that to your current line of research? Yeah, before I started my dissertation [in the late 80s], I wanted to know: "why do you finish your vegetables sometimes and other times you leave them on your plate?". "Why are you hungry for them one night and not the next?" That then evolved into the idea of environmental factors that affect our overall eating patterns. It's a lot more complex than people think because so many of our eating behaviors are automatic. This is all about getting below that surface. One of my first research studies had to do with family serving behavior. We had people come in, eat, and then answer questions about what they ate. Then, we showed them video footage of their meal. It is amazing how many people flat out deny, or are not aware of, their eating behavior. You'll say to someone, "you had three servings of peas." They'll tell you, "No, I only had one!" You feel like saying, "Well, unless you have an evil twin..."
It's not until you show them the videotape that they change their mind. I once had a woman cry when she saw herself eating on camera! My research considers three angles. Not only what people are eating and how much of it, but also with what frequency. How did all that research turn into Mindless Eating? In 2004, I was in France and thought to myself, "I'd like to write a book, but I don't know if I want it to be academic or pop." That year, Bonnie Liebman of the Center for Science in the Public Interest interviewed me for their Nutrition Action newsletter, and suddenly a lot of requests for book deal started coming in. Most of them were e-mails and, I don't know, nothing really stood out. Then I got a letter -- an actual letter! -- from Bantam Dell Books. One of the things I liked about them is that, as they told me, they are in the business of creating "real books that people read." Interesting you say that, because I think that's definitely one of the factors behind the popularity of Mindless Eating. It is relatable for and interesting to the average consumer. So at this point, it's been a few years since the book came out. I was wondering about recent developments. For example, have you conducted any research on the effects of calorie postings in fast food restaurants? Oh yeah, I was involved in a VERY well-done study with Carnegie Mellon in regards to calorie labeling. We looked at McDonald's, Subway, and Starbucks in terms of what consumers were buying before and after calories went up. And, you know what? The results were indeterminant. They were all over the board. Some people consumed fewer calories, others didn't. I would actually be suspicious of anyone who told you they have seen a dramatic effect as a result of calorie labeling. That strikes me as really odd. What are your theories regarding the results of that study? There's a few things to consider. First of all, when it comes to weight loss, a lot of people think: Yeah, I wouldn't mind losing ten pounds, but I don't want to change a thing." Then there's reactance, which is a psychological term. It's basically resistance. Reactance is at play when you're in your car and the person behind you honks so you pull away more slowly than you would otherwise. (Laughs) Or when you know someone at a restaurant is waiting for your table, so you sit there and take a little longer. Yeah. So I think, in a way, some people are seeing these calories and thinking, "Oh yeah? Well, you're not going to tell ME what to eat!" Something similar happened in a study I did with Cornell. So, Cornell has a huge dining hall that services about 1100 people at one time. I wanted to see what effect going tray-less would have. I thought it would have two positive effects -- it would result in reduced waste and reduced calories. The idea being that people couldn't pile everything on at once but instead had to get up from their table each time they wanted more food? Yeah, exactly. Well, the results came in, and that night there was roughly 30 percent MORE plate waste! I think it comes back to that idea of reactance, where people saw this and thought, "Fine, I won't use a tray, but I'm not going to eat less." But that's not to say that I think calorie labeling isn't useful. Let me tell you something. The other day I went to Sbarro and saw that the slice of pizza I wanted was 787 calories. Aaaaaaaah!! So I think these calorie postings are going to serve as incentives for these food companies to say, "Alright, wait a minute, I want to turn that 787 into 690." I think it's going to nudge companies to drop the numbers, and that's what will, in turn, affect consumers. Speaking of consumers, you recently finished your one-year post with the United States Department of Agriculture’s Center for Nutrition Policy and Promotion working on the Dietary Gudelines. How did that go? Oh, it was great! I thought I was on a mission from God! My last day was January 20, when the new president took office. I was literally sending e-mails at 11:59 PM on January 19. I was still e-mailing at 12:05 AM on January 20, and I remember thinking "Wow, they didn't shut off my inbox!" Then I got up to grab something to eat, and about ten minutes later I came back and I no longer had access. Any sneak peeks as to possible changes we may expect in the next round of Dietary Guidelines? I was involved with the selection of the 13 Dietary Guidelines committee members, and 11 of them have a behavioral focus. They operate where the rubber meets the road. That's important, because they take pages upon pages of data and transform it into information for the masses that can be summarized in just a few sentences. So to wrap up, I'm interested in hearing about research you are in the process of conducting now. Oh yeah, sure. Well, we're looking at what happens to people's eating behaviors when they sit next to someone who has a much higher BMI than they do. We are also doing a study where we have someone wearing a fat suit and going through one side of a buffet very slowly, serving themselves a lot of food. Everyone on the other side of the salad bar takes a much lower amount of food compared to when that person is going through the salad bar without the fat suit on. It's the whole concept of mimicking the attractive person. It's terrible, because weight is the last acceptable prejudice in our society and it can really be crippling to a person's self-esteem. Lately, the concept of "nature vs. nurture" has become central to the issue of childhood obesity. Do you have any thoughts on that from a behavioral standpoint? Well, we conducted a study with 4 year olds. We gave all the kids a questionnaire to take home. The point of the questionnaire was to determine to what extent parents forced their kids to eat everything that was on their plate. Of course, we disguised those questions among lots of filler like "what is your favorite TV show?" "What color are your curtains? ", etc. (Laughs) Exactly. So the parents, on a scale of one to nine, had to rate just how heavily they enforced "the clean plate club" at home. So, you know, nine was "my kids HAVE to finish everything on their plate or there is some kind of consequence" and one was "Ah, if they eat, they eat. If they don't, they don't." We discovered that the children whose parents insisted they finish everything on their plate served themselves approximately 40 percent more cereal in our study. Wow! And based on what you talk about in Mindless Eating... the idea that, once food is in front of us, it is very easy to eat it all, that's a significant finding. Yeah, the thinking is that children who are forced to clean their plate feel like the have no control when it comes to food, so they find ways to reassert their control and independence. Well, it looks like we've actually gone over time, but this has been fascinating. It's been a pleasure speaking with you. Thank you! Oh, absolutely. Thank you and best of luck with everything. Many thanks to Dr. Wansink for his time! Over the past ten days I have had the pleasure of watching two upcoming, vastly different food and nutrition documentaries. First up? Food, Inc -- an incredibly engrossing and harrowing look at the state of farming and food processing in the United States from the people who brought you An Inconvenient Truth. To become familiar with the subject matter before its June release date, visit The Meatrix, where all the grizzly details of meat production are explained. I also recommend checking this link to see if Food, Inc. will be screened at a film festival near you before its limited big-screen debut later this Summer. This is a MUST-SEE for anyone interested in farm policy, agricultural subsidies, agro-business, and the current state of the United States' food chain. You might want to bring some anxiety medication with you. On a more lighthearted note, this past Thursday I had the pleasure of watching upcoming kid-friendly documentary What's On Your Plate?, "[which] follows two eleven-year-old African-American [New York City] kids as they explore their place in the food chain [and] talk to each other, food activists, farmers, new friends, storekeepers, their families, and the viewer, in their quest to understand what’s on all of our plates." While certainly softer (and much easier for children to grasp) than Food, Inc., What's On Your Plate? showcases issues of local agriculture, school nutrition, and big business with very little preaching or finger wagging. PS: I predict an Oscar nomination for Food, Inc. I am in the process of transcribing the enthralling interview I conducted with Mindless Eating author Brian Wansink this past Friday morning. In the meantime, I want to share a little bit of what Dr. Wansink presented later in the afternoon when he addressed 150 New York University students and faculty members about details of his research. His talk, titled "How To Turn Mindless Eating Into Healthy Eating," encouraged professionals in the nutrition field to shake up the traditional research model that commences in isolation in a laboratory and instead begin by thinking about human application first (rather than leaving it for last). It is precisely this alternative research model that led Dr. Wansink to become a pioneer in the science of consumer behavior as it relates to diet and nutrition. One of the most important phenomena he encountered during his research was the ripple effect one small change can have on individuals. In one recent study, Dr. Wansink and his team recruited individuals to take on one small nutrition-related change -- such as eating on smaller plates or not eating in front of the television -- for 90 days. While collecting data, Dr. Wansink observed that the vast majority of these people (roughly 70 percent) were losing weight in increasing amounts each month. Weight loss was not occurring at a steady rate, but actually doubling -- and even quadrupling -- in many instances. What was happening? Was the "small plate" group shrinking plate size even more? No -- they simply began to implement more changes when they saw how painless their first behavioral modification was! A month into eating from smaller plates (and, therefore, almost mindlessly consuming less food), most of that cohort noticed the accompanying weight loss and thought, "Hey, this is painless! I'll keep doing this AND cut down my soda consumption." As a result, Dr. Wansink has seen many individuals lose up to thirty pounds in the course of one year without ever feeling like they had "started a diet" or "sacrificed everything." Stop by tomorrow to read my full interview with Dr. Wansink! Say What? : Pasta... in a Bread Bowl? Behold the latest creation from Domino's Pizza -- penne pasta entrees... served in a bread bowl! As a matter of fact, the chain claims their "pasta is so good, you'll devour the bowl." It doesn't take many brain cells, though, to figure out that items like chicken carbonara, Italian sausage marinara, chicken alfredo, pasta primavera, and three cheese mac-n-cheese nestled inside a thick round piece of bread is far from a "light" option. I'm willing to bet we are dealing with 4-figure calorie values. As soon as the reveal occurs, I will post it on Small Bites. In the meantime, I'll meditate and see if I can come up with the answer to: "What higher-up at Domino's passionately believes Americans are clamoring for pasta in a bread bowl?" 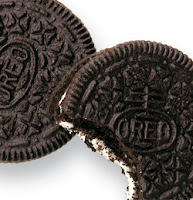 A reduced-fat Oreo cookie contains _______ fewer calories than a regular Oreo cookie. Leave your guess in the "comments" section and come back on Tuesday for the answer. Administrative Announcement: Taking Your Questions! This Friday, Mindless Eating author (and professor of consumer nehavior at Cornell University) Brian Wansink will be visiting New York University -- and I have the opportunity to sit down with him, one-on-one, for thirty minutes! This time around, I want to give you the chance to submit your questions for this upcoming "Speaking With..." segment. Leave your questions for Brian in the "comments" section and come back next week to read a transcript of our interview! As a reminder, "Wansink's award-winning academic research on food psychology and behavior change has been published in the world's top marketing, medical, and nutrition journals. It contributed to the introduction of smaller "100 calorie" packages (to prevent overeating), the use of taller glasses in some bars (to prevent the overpouring of alcohol), and the use of elaborate names and mouth-watering descriptions on some chain restaurant menus (to improve enjoyment of the food). " In Gwyneth Paltrow's new site she gives nutrition advice. She recently said that a person should try to go 12 hours between finishing dinner and beginning breakfast. 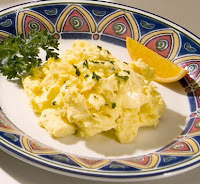 She states that breakfast should be a "break from the fast" (12+ hours) to allow the system to rest and detoxify. Gwyneth didn't have much nutritional credibility with me earlier this year when she blogged about the health miracles of detoxing. Let's find out if she has redeemed herself with her latest batch of advice. No need for a drumroll -- the answer is NO, she has not redeemed herself. The number of hours that pass between your last bite of food prior to hitting the sack and waking up the next morning are irrelevant. There is nothing magical about twelve hours. Eating breakfast nine hours after finishing dinner has no negative effects on health or digestion. Let's assume you had a late snack at 11:30 PM and went to bed an hour later, at 12:30 AM. Eight hours later (at 8:30 AM) you wake up. I find it absolutely ridiculous to expect you to wait three hours to eat breakfast! If anything, by the time you have your first morsel of food, you'll be so famished you'll overeat. I would much rather you focus on what you're eating for breakfast. Waiting twelve hours to load up on a breakfast low in fiber and nutrients but high in added sugars and calories makes no sense. My other concern with this "health halo" surrounding fasting and spending hours without eating is that it is a half step away from glorifying anorexia nervosa. Where did celebrities get the idea that an Oscar and a health credential are the same thing? Would you ever eat the meat -- or drink the milk -- of a cloned cow? Heck, why am I even asking? You really have no choice! One of George W. Bush's last decisions as Commander-in-Chief included quietly passing legislation allowing the meat and milk of cloned animals to be sold to consumers without being labeled as such. The Food and Drug Association's argument is that since food from cloned cattle is no less healthy than that of "conventional" cattle, there is no need to differentiate between the two. In fact, some documentation quotes scientists as saying cloned meat can actually be better, since it often results in tender, juicier steaks (right, I am sure this was the driving force behind animal cloning). The main line of reasoning behind cloning is to provide more food to the American public. Really? The food industry is already supplying an average of 3,900 calories per person -- almost double the requirement for most people. Do we really need more food? And if we do, why is red meat the chosen one? The chances of you having consumed food from a cloned animal is low, as the number of them is currently too low to enter the food supply. However, don't expect any special announcements once this happens. Industry response to concerns from consumers? "If you don't feel comfortable eating food from a cloned animal, buy organic." Is mainstream nutrition advice on calcium too focused on dairy products? Like this blog? Vote for it once a day on BlogTopList! Master's Degree candidate on Registered Dietitian track at New York University's Department of Nutrition, Food Studies, and Public Health. Confused about nutrition? I don't blame you. Between information overload and supposed "experts" who are simply mouthpieces for corporations, it's easy to get lost. Small Bites aims to separate myth from reality and lies from truth, with no sponsors to please or agendas to push. You are always free to drop me a line or leave a comment at the end of each post. In The News: "For The First Time"??!! In The News: Game On! Eating Out? Don't Wrap It Up!